Men’s varsity volleyball lost to the Centennial Bulldogs in four sets, 25-22, 21-25, 22-25 and 12-25 on Tuesday, March 12 for the first home game of the season. Freshman Jacob Ceci (#7) had the most kills with 16 while sophomore Slater Fuhrman (#5) had eight kills. Seniors Andrew Corales (#1) and Alex White (#3) contributed with nine and seven digs respectively. 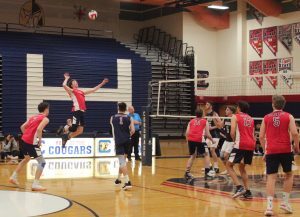 The Cougs defeated the Shadow Ridge Mustangs in four sets, 21-25, 25-14, 25-16 and 25-14 on Thursday, March 14 at home. Senior Randy Cowles (#10) led the Cougs to victory with 12 kills and 14 digs. Varsity plays again today at Basic High School at 6:00 p.m. in the first conference game of the season. Men’s varsity baseball lost to the Centennial Bulldogs 3-6 in the first game of the week on Wednesday, March 13. In the game against Centennial, the Cougars fought hard but failed to catch up after the Bulldogs scored three home runs in the first inning. Juniors Josh Johnson (#28) and John Pashales (#19) had two RBI’s. 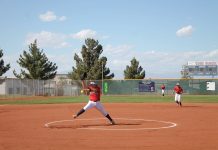 The Cougs then lost to Palo Verde 6-12 on Friday, March 15. Seniors Jett Kenyon (#8) and Ryan Kiernan (#9) both had 4 AB’s averaging .750. The Cougars are 2-5 and play their next away game versus Foothill on Tuesday, March 19 at 3:30 p.m.
Men’s varsity golf placed first in a southeast league match at Legacy Golf Club against Foothill, Liberty, Green Valley and Tech. 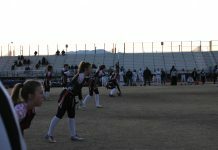 The Cougars scored 314 while rivals Foothill and Liberty scored 336 and 359 points respectively. Sophomore Brett Sawaia scored 75, and senior Michael Sarro scored 79 leading the Cougs to victory. In the second match of the week, the Cougars defeated Faith Lutheran at Anthem 142-149. Junior Brett Sodetz and Sarro both scored 34 points along with senior Dylan Fritz who scored 37. The Cougars play again at Anthem in a league match on Wednesday, March 20.